The Mackie Quad EQ Graphic Equalizer is part of a family of digital outboard gear based on our TT24 digital mixer engineering developments. We thought it would be good to share the love, not to mention the design and engineering expertise developed during the TT24 program. The Quad EQ comes with its own measurement microphone, and has a built-in Sound Pressure Level (SPL) meter, and Real Time Analyzer (RTA) functions. These allow for simple viewing of filter settings vs. actual measurement. The simplicity of the interface makes the unit easy to use for beginners, and fast enough for professional live sound engineers. The sound quality makes the Quad EQ lovely for the high-end user as well. 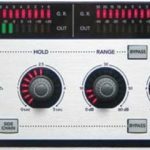 The clever Adaptive-Q design allows the equalization to follow the settings of the 30 EQ filters, without the ripple and boosting effects of common EQ units. In other words, what you see in the display is what you get. People are really attracted to sound engineers who know how to operate equipment with lots of flashing lights, so the Quad EQ was especially designed with plenty of lights in operation.